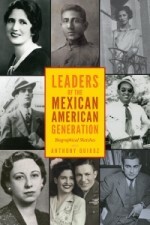 So what did the book’s editor, Anthony Quiroz, write about my essay in the introduction ? Kenneth C. Burt’s chapter sheds new light on the political career of Edward R. Roybal of Los Angeles. Burt describes Roybal as being born to a working-class family with deep roots in American soil (four hundred years) and who served in the military during World War II. As with many veterans, he returned to the United States ready to make significant changes in conditions for Mexican Americans. And while Burt allows that Roybal is perhaps best known for being the first Mexican American elected to a city council since 1881 and for his twenty years of service in the US House of Representatives, another key aspect of his legacy often gets overlooked. Scholars have not duly noted that what kept Roybal successful through those years was his ability to lead through coalition building. Burt notes how Roybal won election to the Los Angeles City Council in 1949. He put together a progressive coalition of left-leaning groups such as Mexican Americans, African Americans, Jews, other immigrant groups, and organized labor. Roybal cut his political teeth by helping organize the Community Service Organization and the Mexican American Political Association. Later he founded the Congressional Hispanic Caucus and the National Association of Latino Elected and Appointed Officials. Having recently obtained a nearly one-hundred-year-old political button bearing the name and image of Manuel B. Otero, I became curious: Who was he, and was there anything particularly interesting about his gubernatorial campaign? Manuel B. Otero ran for governor of New Mexico in 1924 when he was the forty-six. When the voters were counted, it initially appeared that Otero would become the third Latino governor since statehood; the first being Ezequiel C. de Baca, and the second, Octaviano Larrazolo. Long active in politics, Otero’s record of public service included two presidential appointments. President William Howard Taft appointed Otero assistant postmaster of Santa Fe in 1910. Two years later, Taft named him state collector of revenue. Presidents and their political parties used the position of postmaster as a political reward prior to it becoming integrated into the civil service system. The first Latino to head a post office in a city of significant size and import was Hilario Delgado in Santa Fe, New Mexico. He served from 1929 to 1934. Politics drove Delgado’s rise and fall in the postal service. He was, by all accounts, a dedicated public servant and outstanding accountant. The Republican Party nominated him for state auditor, a statewide constitutional officer, in 1922. He was also a World War I hero and community leader, having served with distinction in France. He enjoyed a statewide network as vice commander of the inchoate and politically potent American Legion in New Mexico.